A double bed 140 x 190 cm. 2 single beds 70 x 190 cm. 4 pillows, 2 single bed beddings and 1 double bed bedding. Refrigerator, 3-burner stove, cooking equipment and cutlery for 4 people. The tunneltents are entirely new. Because of the big windows there is a lot of light in the tent, additionally the tent has a big canopy of 2 meters deep. 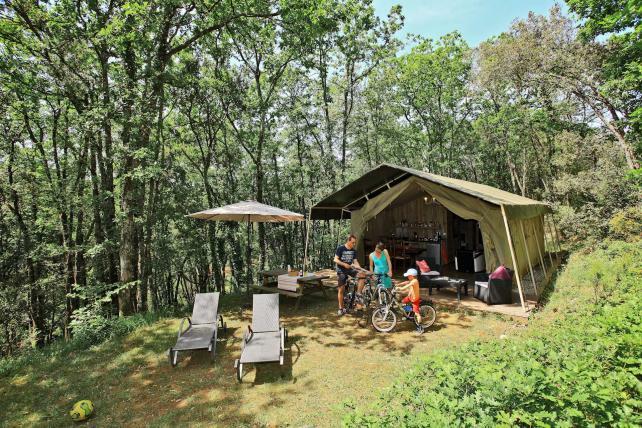 The tents are decorated with wooden furniture and are very cozy to stay in.